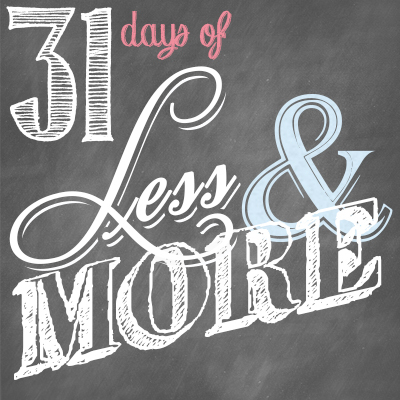 This is Day 5 of our 31 Days of Less & More challenge. To read all the posts in order, start with Day 1, then visit the Overview Page to see the entire series. Have you ever stopped to wonder how many times per day you say the words me or I, or how much of your time is spent thinking about how something will affect you, rather than the way it will affect those around you? If you are anything like me, you probably haven’t. In fact, until I sat down to write this post I don’t think I had ever really thought about my own tendency to be entirely self-absorbed, though I usually have no trouble spotting this same trait in others. If we were to be brutally honest with ourselves, how would we answer the following questions? When was the last time I phoned a friend just to ask about them—how they were doing, what their concerns were, how I could pray for them—without actually wanting to talk about your own problems or concerns? When was the last time I surprised someone with an act of service—a homemade meal for a sick church member, fresh baked cookies for your child’s teacher, a care package for a local soldier, yard work for an elderly neighbor, a day of babysitting for the single mom down the street—for no real reason other than to do it, without being asked and without expecting anything in return? When was the last time I really listened to my children or spouse, without criticism or judgment or an agenda of my own? 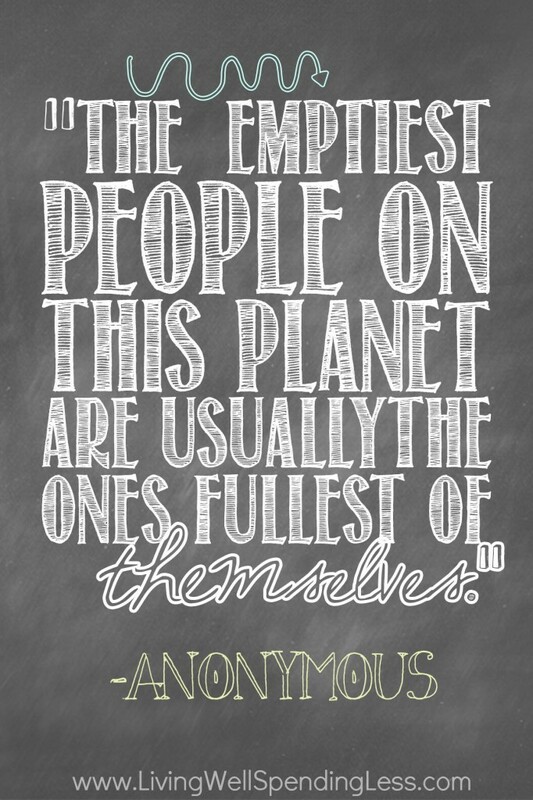 I think we are all inherently a little bit self-consumed. It is hard not to be when our perspective of life is colored by our own experience. It often takes real, intentional effort to step outside of our own needs, preferences, and desires to instead consider those of others. It might even seem painful, at least at first. The more you take, the less you get. This lesson has never been clearer to me than when I observe my two daughters. One has a tendency to always think she is somehow missing out. She plots and schemes to figure out how she can get the bigger piece cake or the more favorable position or the preferred water cup. She is often consumed by her need keep the best for herself, so much so that even when she does get what she thinks she want, she can’t enjoy it for fear of missing something else. The other was born with an innate sense of compassion and others-centeredness. She doesn’t care whether she wins or loses—simply playing the game is what matters most—and she will usually offer the best choice to her sister without hesitation, or give her whatever prize she has won, even if it means she goes without. Guess which one is usually happiest? As a mom it is my job to guide both my children towards an attitude of service and selflessness, but as adults we must be careful to guide ourselves. It takes conscious effort to let go of a me-first mentality, but the rewards are far greater than you can imagine. Be sure to read Edie’s corresponding post about More Service HERE. Do something—anything—to serve someone else today. Tell us what you did in the comments below, or on Facebook. I’m so thrilled to have my sweet friend Crystal Paine of Money Saving Mom joining our Less & More challenge this month! Be sure to check out her thoughts on less comparison & more confidence from yesterday’s post! What act of service will you do today? This one really got me thinking today. It is not easy to admit that I can be really selfish sometimes. I am going to call a friend this morning to ask about HER, and then I am going to bake cookies for our elderly neighbor lady. Loving these challenges. To stave off some of the ‘plotting’ when it comes to dividing something, my mom used to have one of us cut the pieces… then the others got to pick first. Talk about some precision cut pieces! Sorry for 2 comments… the ‘edit’ button didn’t work. Serving others – we’ve been watching a new friend’s beagle for the last 2 days while she went thru a surgery. I try and give back by cooking & hosting events in my home. It’s the least I could do to show my family & friends how much I appreciate them. Especially now that the Holidays are soon upon us. Financially it’s almost impossible to buy gifts for everyone on my list. Instead I’ll be hosting a cocktail party . Today we will host a small get together to celebrate my friends birthday. Thanks! Made an unexpected call to a friend today just to say Hi and listen. After I write this comment , I’m unplugging for the rest of the day, and playing with my kids. Sometimes the ones closest to us need to our attention more than anyone else. And if they are happy, maybe their smiles can bring a bit of joy (or service) to someone who needs just that.. a smile. I am really enjoying these posts.What a sacrifice of your time it must be.Thank you.I have been looking for something like this and have been blogging about my incredible experiences with these challenges.Truly inspiring!May you be blessed to continue this endeavor with health and needed preperation to bless so many peoples lives.Again, thank you! Are you reading my mind, Ruth? 🙂 One of the things that I am STILL working on is self-centeredness. I have to remind myself daily what is going on with my friends and kids (and grandchildren now) is not ALWAYS about me. In fact 99% of the time I am not even in the equation. One quick praise that happened a long time ago is that as a teenager, I had severe acne and back in the 50’s, there wasn’t nearly the research there is today. One doctor would treat me once a week where I would end up with red, swollen pimple scars. It hurt so badly when he did whatever it was he did (I don’t know or remember), tears would stream down my cheeks. The worst part of this was how UGLY I felt afterwards. I was extremely self-centered at that point in my life but to be fair, most teens are. I was piano accompanist for our junior choir at church and that night was choir practice. When I was leaving after practice, the pastor’s young daughter (maybe 11) came up to me and said, “Stephanie, you are so pretty.” She meant it too. I was so touched. I thanked her then when I got in the car, I burst into tears of gratitude. So the other thing this taught me is that my perception of myself is just that: mine. Obviously others see me differently and I can’t let my self-centeredness rule me. Im battling post partum depression and have been using this 31 days to supplement counseling in order to regain control of my emotions. For the challenge today Im going to spend tonight hugging and cuddling my husband. I know hes been feeling neglected. After the baby goes down for the night im always about what i have to get done or giving myself some alone time and while those things are important i also need to remember that he needs to feel loved too. I know he misses the old me and im going to try every day to remind him how much i love him through words and actions.